How are RNA-Seq results stored? Why are visualization techniques needed? How to select genes for visualizing meaningful results of differential gene expression analysis? RNA-Seq analysis helps researchers annotate new genes and splice variants, and provides cell- and context-specific quantification of gene expression. RNA-Seq data, however, are complex and require both computer science and mathematical knowledge to be managed and interpreted. Visualization techniques are key to overcome the complexity of RNA-Seq data, and represent valuable tools to gather information and insights. In this tutorial we will visualize RNA-seq data from the CuffDiff tool. To make sense of the available RNA-Seq data, and overview the condition-specific gene expression levels of the provided samples, we need to visualize our results. Here we will use CummeRbund. CummeRbund reads your RNA-Seq results from a SQLite database. This database has to be created using CuffDiff’s SQLite output option. Instruct CuffDiff to organize its output in a SQLite database to be read CummeRbund. By default, when data is imported via its link, Galaxy names it with its URL. CuffDiff’s output data is organized in a SQLite database, so we need to extract it to be able to see what it looks like. For this tutorial, we are interested in CuffDiff’s tested transcripts for differential expression. Each entry is a differentially expressed gene, which is described in terms of the following attributes. We want to keep only the significant differentially expressed genes. How to retain only the significant differentially expressed genes? Which column stores this information? We now want to highlight the transcripts whose expression difference, the log2(fold_change), has been statistically assessed as both high and significant. What column stores the information of significance for each record? Which conditional expression has to be set to filter all records on the selected column? How many rows are allocated for the table’s header? How many entries were originally stored in the table? And how many after the filtering operation? Review the meaning of each column, and look at your data. The statistical score, assessing the differential expression significance, is stored in column 13 We will sort all records on the basis of their Q-score (column 13) and log2(fold_change). param-repeat Insert Column selection, and parameterize the Sort tool to sort on column 10. Be careful of the sorting order! Are there any rows allocated for the table’s header? In that case, set “Number of header lines to skip” accordingly! Which gene transcript has been statistically assessed as both high and significant? In this section we will parametrize CummeRbund to create different kinds of plots from our input data. The input data used to create the visualization comprise 3 conditions: hits7 (Patient 1), hits8 (Patient 2), and hits9 (Control). Our first CummeRbund plot is the “Expression Plot” of the isoforms of gene NDUFV1, which shows the expression differences of isoforms NM_001166102 and NM_007103 among the three conditions. Error bars capture the variability of the distribution of FPKM values: the broader the distribution of FPKM values, the larger the corresponding error bar. Our plot has a modest number of isoforms, and is therefore easy to read. However, with a high number of isoforms and expression variability among different conditions, the plot can look very busy. We can therefore change the visualization type by selecting another type of plot. Let’s change visualization. 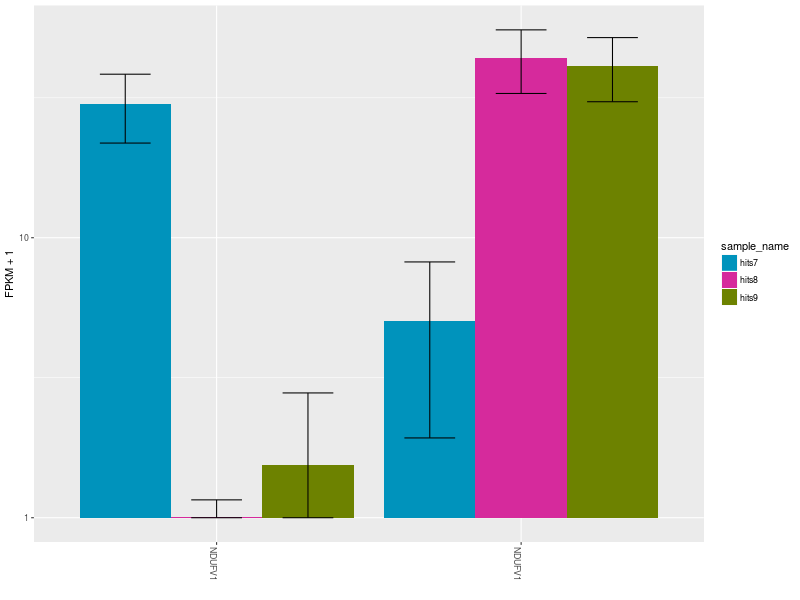 The Expression Bar Plot of gene NDUFV1’s replicates NM_001166102 and NM_007103, shows the expression changes across the three aforementioned conditions. These plots are shown also in this Galaxy video tutorial. 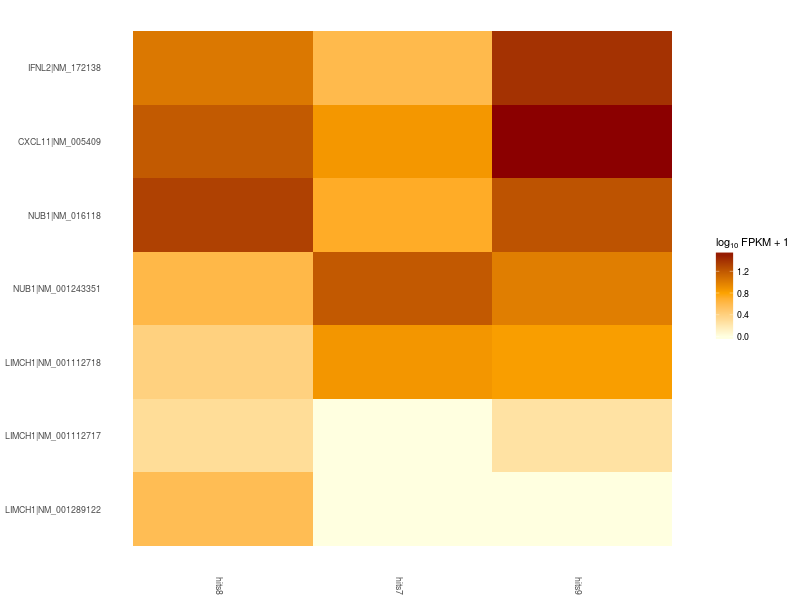 Let’s now create a heatmap to plot the expression levels of the significant differentially expressed gene isoforms obtained from our filter and sort operations. As a showcase example, let’s consider only the top 5 differentially expressed genes. Heatmap of significant differentially expressed isoforms of genes LIMCH1, IFNL2, CXCL11, NUB1. Differences in up- and down-regulation of certain gene isoforms across Patient 1 (hits7), Patient 2 (hits8), and Control (hits9), are visible in the lower and upper part of the heatmap. For more sophisticated visualizations of your RNA-Seq analysis results, try selecting different CummeRbund plot options and parametrizations. Have a look also at CummeRbund’s manual. 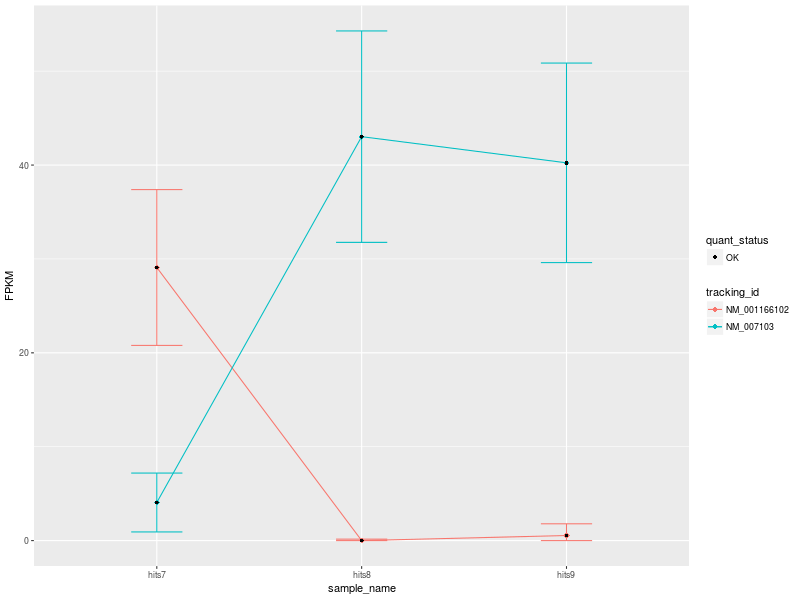 Alternatively, you can modify a plot’s style by changing CummeRbund’s R output! CummeRbund’s R outputs are ggplot objects. Look here to learn how to change fonts, colors, error bars, and more. Visualization tools help researchers making sense of data, providing a bird’s-eye view of the underlying analysis results. In this tutorial we overviewed the advantages of visualizing RNA-Seq results with CummeRbund, and gained insights on CuffDiff’s big-data output by plotting information relative to the most significant differentially expressed genes in our RNA-Seq analysis. This material is the result of a collaborative work. Thanks to the Galaxy Training Network and all the contributors ( Andrea Bagnacani)!